For any given file, Write a Java program to find a line with maximum number of words in it is a very common interview question. 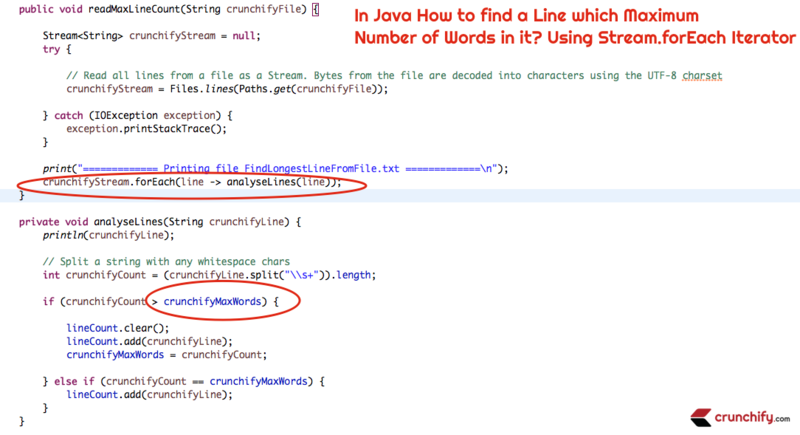 In other words, write a Java program to find longest line from file. In this tutorial we will go over all detailed steps to programatically figure out longest line. Read provided file using Java8 Stream.forEach() loop. In below Java program we will read file FindLongestLineFromFile.txt located under Documents folder. Please update file and location as per your system setup. print() and println() are the simple print Utilities. Once reading complete file – we are printing result. How do I split a string with any whitespace chars as delimiters? Simple way is to split a string in java using \\s+ delimiter. Above line contains 15 words. I hope you find this tutorial useful and interesting. Let me know if you have any more questions. Java: How to Find Maximum Occurrence of Words from Text File?